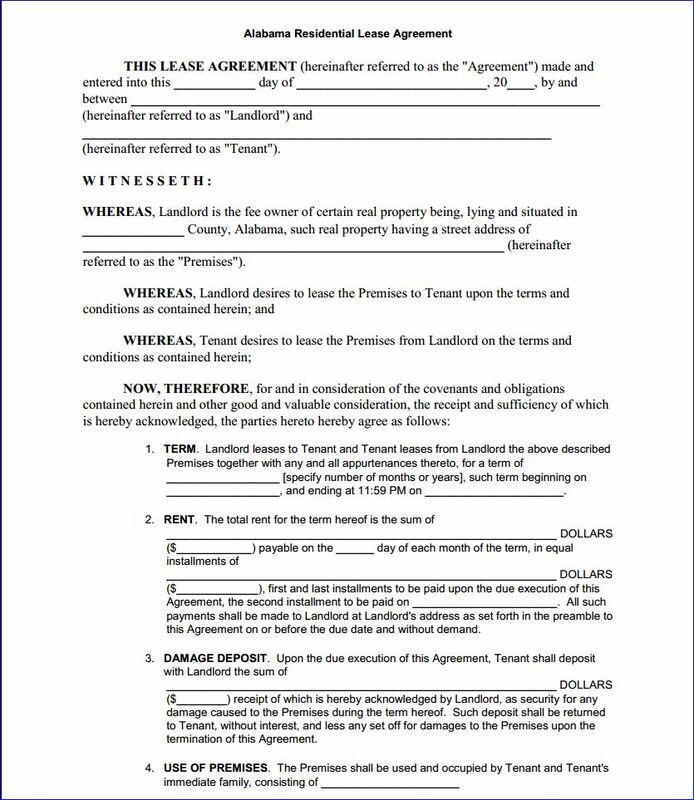 Alabama Residential Lease Agreement Template is a legal document that can be used only when you are leasing a residential property in Alabama. Download this template by clicking on the link at the bottom of this page. If you need legal assistance we recommend you to contact an attorney. Below we also have details on how to fill the Residential lease agreement template. Start by typing your Contact Number, the Property you are interested in Leasing, your email address the date this application was created. Followed by the Personal Identification Information of the Tenant like; name of the tenant, any other name the tenant has used, his driver’s license number, state of issue, date of expiration, Social Security number, date of birth, marital status, name of spouse (if any). Then any previous addresses that the tenant has lived at and the details like; present address, ZIP Code, how long the tenant was living there, a reason for leaving and the landlord’s name and phone number. Also mention the employment details of the tenant; place of employment, address, city, state, ZIP Code, name of the supervisor, contact number, the tenant’s job title, work hours, his monthly pay, etc. Read the terms of residency/debtor information like; if the tenant wants to the side at the said property indefinitely, has the tenant ever filed for bankruptcy, does the tenant owned property that was foreclosed, if he is a party in a lawsuit. You would also need the Banking information i.e. bank name, phone number, checking account number. Any credit reference, their names, phone number. Personal details like smoking preferences, pets, if the tenant has ever been evicted from a previous rental unit. The motor vehicle information of the tenant like; year, make/model, colour, tag number of and state. The list of credit cards owned by the tenant, their type, and the last four digits of the card number and details of any credit owed on those cards. Each State in the United States of America have a different format for the Lease Agreement and the Alabama Residential Lease Agreement can only be used in the State of Alabama.